B & T box covered with construction paper. Not one but two of my fellow Flannel Fridayers recently posted about this little ditty and how they use it-- Anne at So Tomorrow and Katie at Storytime Secrets--I guess this is an inspiring rhyme, because I've been using it regularly for a while too! I thought this was a great opportunity to use some of the many puppets I inherited in this job. So I took a old B&T box with the flaps cut off (book boxes are great because of the flat bottoms). 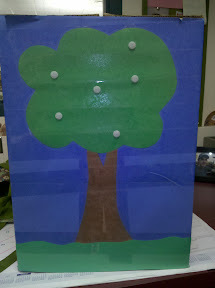 I covered the bottom with construction-paper and then reinforced with book tape. Next, I used velcro dots, and placed them on the tree. I made six, because I want to free children from the tyranny of the number five...or because I just felt like it. I spent a dollar on a package of six large pom-poms (oh, that's where the six came from) and attached the grippy side of the velcro dots to the pom-poms. When I use it in storytime I grab whatever six puppets I feel like using that day--sometimes I'll choose a silly one like the dragon or octopus if I can tie it into my theme, but these are the ones I have that make the most 'sense' (except maybe the bunny--I don't really think they eat apples, but I can imagine one taking a nibble). 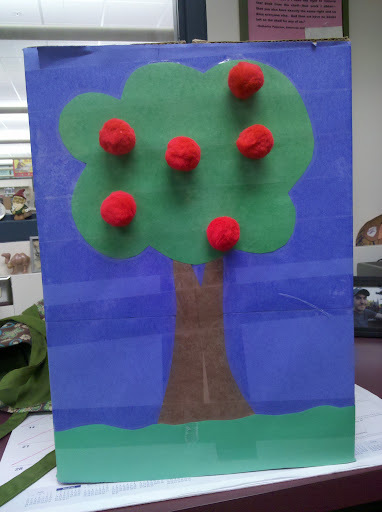 When I use it in storytime, I put the box up on my lap or table and all the puppets are inside the back of the box mostly out of sight. We say the rhyme with actions. When we get to "Guess who came to eat?" 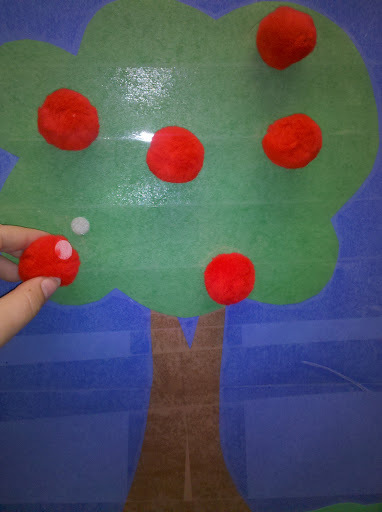 I pause, and then peek part of the puppet out or make a noise/action so the kids can actually guess. 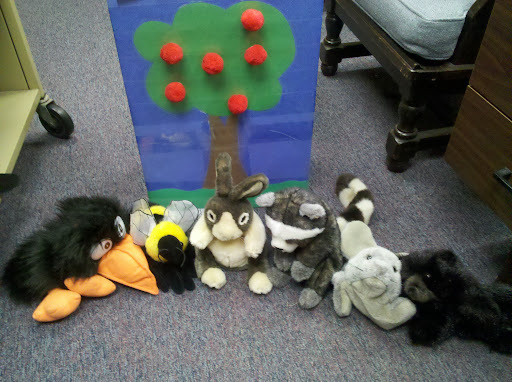 The puppet takes an apple, I make a munching noise/motion, and then say, "Bye rabbit!" and make the rabbit wave--the kids all wave/respond and then we go on. I don't use the second part of the rhyme because I never memorized it, but I bring the animals back and we talk about them--which ones fly, which has long ears, etc. I should memorize it though! Next time. The crow puppet steals the show. There's a squeaker in the beak that really does sound like a crow!--he's always the last one to come out and he flies and swoops cawing madly. I don't know where this puppet came from, but he's great! Just yesterday i was looking for an apple thing which has seemingly disappeared. 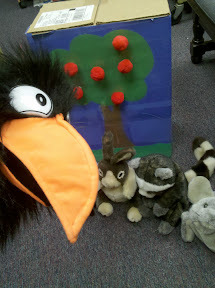 This is a great substitute and I really love using my puppets in storytime! This will be a wonderful substitute. I have the same crow puppet! I find it a little creepy, but the babies are in LOVE with her.